comScore released one of its rare updates to the EU5 (Spain, UK, France, Italy and Germany) smartphone market. Note that the data is claiming to show installed base and not sales in any particular period. What interests me is a comparison or contrast between the European market and the US market. The EU has about 500 million inhabitants while Europe overall has 731 million. The EU 5 total about 314 million which is very nearly the same as the US (311.6 million). Therefore the EU5 is a good comparable to the US in terms of population. 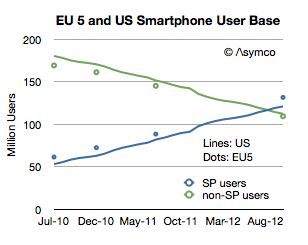 As the graph above shows it’s also remarkably similar in its adoption of smartphones. Note that the scale reflects users and since the populations are very similar then the penetration should also be similar. On Samsung’s use of Capital, Value Chain Evolution and Below the Surface. Why would you read the balance sheet of a tech company, the difference between R&D and capital spending, how to prevent suppliers becoming competitors and what are the economics of systems and application software in a device-centric model. Finally, why you shouldn’t confuse obscurity with secrecy. via 5by5 | The Critical Path #67: Manufacturing Flying Cars.